A number of fans seem to share a common opinion yoshitoshi ABe's recent anime TV series NieA under Seven (NieA_7). They all seem to be really taken aback that such a low-key series as NieA_7 could have come from the same minds who made the innovative Serial Experiments Lain. Still, creators like Hideaki Anno (Neon Genesis Evangelion, His and Her Circumstances) haven't received as much flak for their divergent series as yoshitoshi ABe has. Maybe it's the overall nature of the show that has brought on such a controversy. 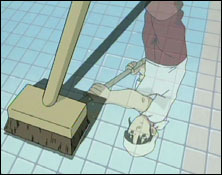 Taking place in the near future, the series examines a neglected part of the Japanese culture in regards to animation. The series focuses on the life of a poor college student struggling to get by. NieA_7 presents an endearing and melancholy examination of life in contemporary Japan, a subject that seems virtually ignored in most anime, especially those released in America (the only other anime released in America that comes to mind is Rumiko Takahashi's Maison Ikkoku). In a genre complete with large robots and big-breasted sorceresses running through Downtown Tokyo, there is painfully little time given to stories that cover all of these little details that makes life in Japan a distinctly unique experience. Working part-time jobs at all hours, making long commutes from home to school, haggling over food, drinking iced barley tea in the summer heat, and walking with friends in the rain with your umbrella - these are all experiences that are rarely communicated in the media of anime. Media, especially in cinema and television, specializes in providing fantasy in a myriad of formats, and understandably so. People around the world watch television to experience adventures, stories, and things outside of their daily experiences. Japan is surely no different. The main character, Mayuko has to deal with all of the issues of daily life, just like an ordinary person. So why would most viewers tune in to see someone else go through a comparatively more boring and torturous existence? The series, however, presents these daily routines in a unique manner, giving the melancholy tribulations of Mayuko's summer a sense of wonderment and magic. Even though this story takes place in our near future, people's lives do not seem to be drastically impacted by the presence of aliens in society. This presents the viewer with a look into normal, dreary lives... with a twist. The staff of NieA_7 thus provides a series that seems to be more distinctly Japanese than most other anime I've encountered, especially American releases. The series captures the feel of living in Japan today, right down to the smallest details of shopping for the cheapest food or carrying out the 200-yen convenience store umbrellas. Bicycles, buses, the constant commutes, all of these small details of life are captured in a blue-tinted lens. This provides a new and fresh look on how most people live their lives, capturing the beauty and magic of life on the most basic level. The depth of the series is further magnified in the subtle ways the creators tackle certain problems evident in contemporary Japan. The experiences of the Earth-bound aliens echo the many issues of racism and hierarchy that exist in Japan. Through Chada and Karna, we see just a hint of how foreigners in Japan interact with Japanese people, both in the workplace and in other basic interactions. 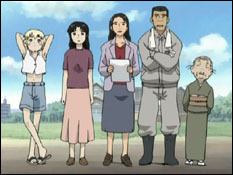 Through the alien's class hierarchy of "pluses" and "unders", the audience gets an idea of how the Japanese themselves interact based on ancient ideas of superiority and racial purity (this concerns specifically interaction between the Burakumin, Ainu, and Okinawans with people of mainland Japan). 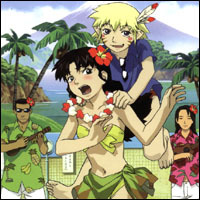 The events of episode 12,"NieA Under Seven Bath (The Latter Part)," become especially poignant and relevant when Mayuko goes to the police to file a missing persons report on NieA, is told that effectively, NieA's status as an under seven leaves her virtually non-existent in the eyes of the government. NieA_7 is definitely not a series for everybody, either in Japan or America. Even so, it deserves re-watching and re-examination by American fans. Understanding the melancholy magic of NieA's world will help bring a greater understanding of the culture that continually brings us anime fans so many great works of fiction, and possibly even a greater understanding anime as a whole. Images Copyright Triangle Staff/Pioneer LDC, Inc. Copyright Pioneer Entertaiment (USA) Inc. All rights reserved.